Come celebrate the holidays and dance the night away! 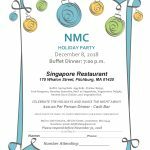 The North Medford Running Club will be celebrating the holidays with its annual holiday party on Saturday, December 8th at the Singapore Restaurant in Fitchburg, MA. The buffet dinner begins at 7:00 p.m. It is $20 per person with a cash bar. RSVP to Deb Fontaine before November 30. For more information and RSVP download flyer here. Celebrate the season. Bring your friends, family, bells, Santa hats, and fun! 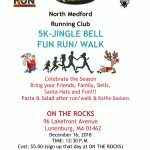 There will be pasta and salad post race along with fabulous raffle baskets.